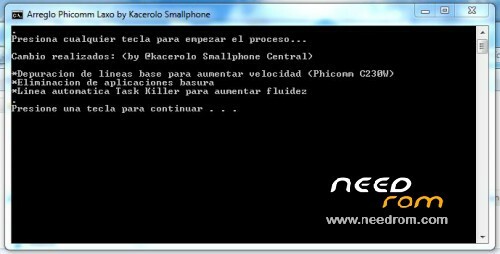 Custom Rom for Phicomm Laxo from Smallphone Shops in Spain. This is based from phicomm c230w. Depurated lines for more task velocity. Run Programm in spanish language by defect. Unzip the folder, double click over "flashear", connect mobile by usb with usb depuration activated, press any key and wait. I agree with kapetanios. The phone has a major problem when trying to surf in the web. It force closes the browser and you have to start from the beginning. I did not flash this ROM yet, but since the problem of memory handling isn't fixed I will not flash any ROM. Ok, so I will check ram problem and i´ll fix it. Thanks for your comments. when you reboot at first the phone has 100-120mb ram free after a day it left only 50mb ram free without many apps installed. Desaparece la opcion de cambiar de camara frontal a trasera.